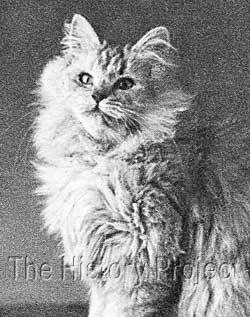 Although 'Silver Monarch' has of himself no particular claim to fame, either as a sire or as a show cat, he can count among his full and half-siblings, many of the greatest foundation Chinchilla Persian cats that ever lived. And he can claim to be one of the rarest of commodities, a Silver son of the eminent 'Ch. Silver Lambkin'. Certainly, if it had not been for his amazing little dam, and her female offspring, he would probably not have come to notice at all, but through his famous sisters and half-sisters, the legacy of the family he was born into, lives on. 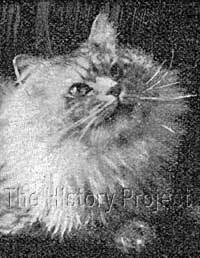 'Silver Monarch' was born 1st June, 1899, the result of a repeat breeding between the enigmatic 'Ch. 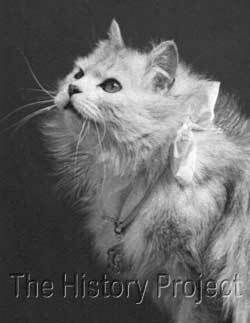 Silver Lambkin' and Mrs. Wellbye's modest but by now famous, 'Dossie'. Although 'Dossie' had earlier had no particular distinction or claim to notoriety, she had in the two years preceding this encounter, proven her immense worth as a brood queen. In the first breeding to 'Ch. Silver Lambkin' in 1897, she produced two exceptional females, namely 'Silver Jessamine' and 'The Silver Lily'. And as if that were not enough, in the very next season, when Mrs Wellbye very wisely bred her in 1898 to 'The Silver Squire', she again produced two show quality females, namely 'Silver Lotus' and 'Silver Veronica'. 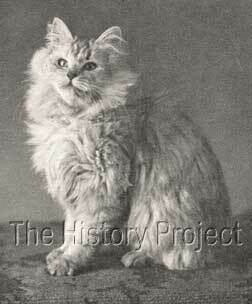 So in 1899, Mrs. Wellbye took the decision to repeat the original breeding of 'Dossie' to 'Ch. Silver Lambkin', perhaps fearing that this might well be the last opportunity she would have to use this eminent but aging stud. Certainly no-one in 1899, could have foreseen that this amazing ten year old stud male, would have another seven years left in him, passing as he did at the ripe old age of 17 in 1906! Apart from Mrs Wellbye, there is no record of 'Silver Monarch' having ever been owned by anyone else. 'Silver Monarch' had a number of famous siblings, both full and sire and dam siblings. 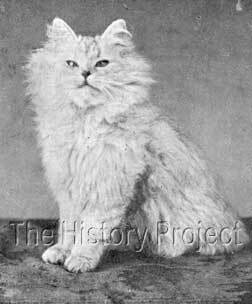 Of his well-known full siblings, none were from the same litter, but from a previous breeding between his dam 'Dossie' and his memorable sire, 'The Silver Lambkin'. These were 'Silver Jessamine' and 'The Silver Lily'. 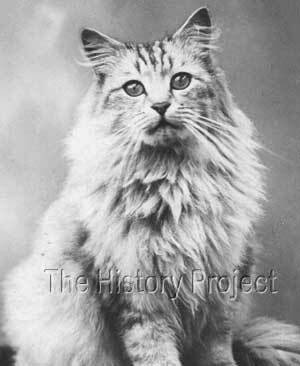 This breeding took place two years earlier, in 1897, and in between that litter and the one in which he was born in 1899, 'Dossie' was bred to 'The Silver Squire' to produce his two renown dam-siblings, 'Silver Lotus' and 'Silver Veronica' in 1898. His older full sisters had already carved out a name for themselves, one, namely 'Silver Jessamine' (owned by Miss R. Packham), as a 'poster girl', popular with the public and featured on many a postcard; while the other, 'The Silver Lily', (owned by Mrs. Bluhm), had made a name for herself as a top show cat and as a reliable breeder. These two had earned the popularised title of 'Dossie's Daughters'. From this breeding came two more females and a male, the females being photographed extensively by E.Landor (Ealing) both as kittens and young cats. 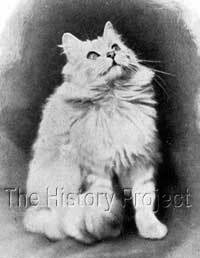 The male was registered as 'Lucifer', but although he is listed under Mrs Wellbye's name, there are no photographs extant and no records of any progeny from him. 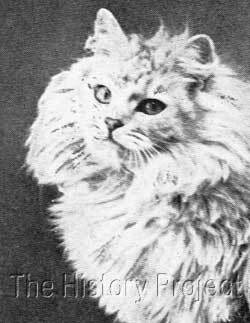 By the time that 'Silver Monarch', had arrived on the scene in 1899, these dam-siblings, from the previous litter born in 1898, were already establishing themselves as well-known show cats. 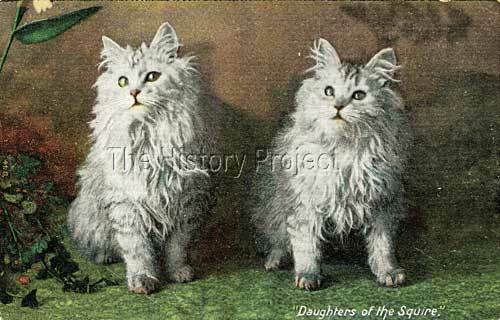 These were 'Silver Lotus' and 'Silver Veronica' (aka St.Veronica), by now invariably referred to as 'The Squires Daughters' or 'Daughters of The Squire' in deference to their well-known sire. Of sire siblings, it would be futile to even begin to list them here as there are so many, but suffice to say that 'Silver Monarch' was in excellent and laudable company, counting among his sire siblings, the very greatest among Chinchilla studs, such as the renown 'Ch. Lord Southampton', 'Ch. Lord Argent', 'Silver Mist', 'Silver Tod Sloan', 'Silver Squire', 'Seafoam', 'Silver Owl', 'Mowgli', and many more besides, plus a host of equally impressive females, in a range of colours and patterns, all sired by 'The Silver Lambkin'. The above, are just three of the many sire-siblings of 'Silver Monarch'. Any son of 'Ch. Silver Lambkin' out of a related line was worth his weight in gold at a time when access to the lines to cement this colour variety was paramount. So it comes as no surprise that he was retained by Mrs. Wellbye as a possible breeding prospect. There exist at this time, no show records for 'Silver Monarch'. Very sadly, there are no records of any progeny from 'Silver Monarch' which is extremely disappointing, given his obvious good looks, excellent boning and bold clear eyes. One can only imagine what kind of heritage he may have left behind, if he had been successfully integrated into a silver breeding program. But alas, we will have to make do, with enjoying his lovely countenance. 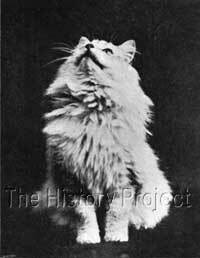 Fortunately we do have some images of 'Silver Monarch' as both a young cat and a mature adult. 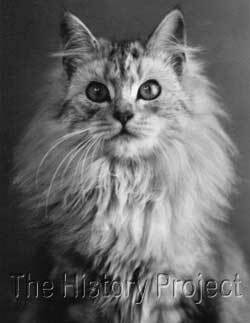 The two cropped images shown below were taken by E.Landor, in the same photographic sitting, when 'Silver Monarch' was a young cat and his half-sister , 'Silver Veronica' was a year older. Their cropped photos are purposely shown side by side, so that you can see they were photographed on the same table and cloth and in a similar pose. The more self-assured 'Veronica' looks far more comfortable during her sitting, while the young 'Monarch' a little unsure of his surroundings, squints moderately at the camera.